The walking stick had once lived in the desert proud and strong. One day it was felled by the relentless Mojave winds and it lay in the sand to bake in the sun. It watched the stars and moon rise every night, and napped during the day when the sun was too bright. For months it dried out and became preserved and straight. The next chapter of the walking stick’s life was in my backwoods, traipsing up and and over the hills, following the deer trails that made patterns in the dew, pushing aside brush and overgrown grasses and weeds on our hikes. One day the walking stick was laid down on the front porch, leaning against a corner of the house. It looked at rest there, next to the rocks and cacti on display. That is how the walking stick became an art piece. 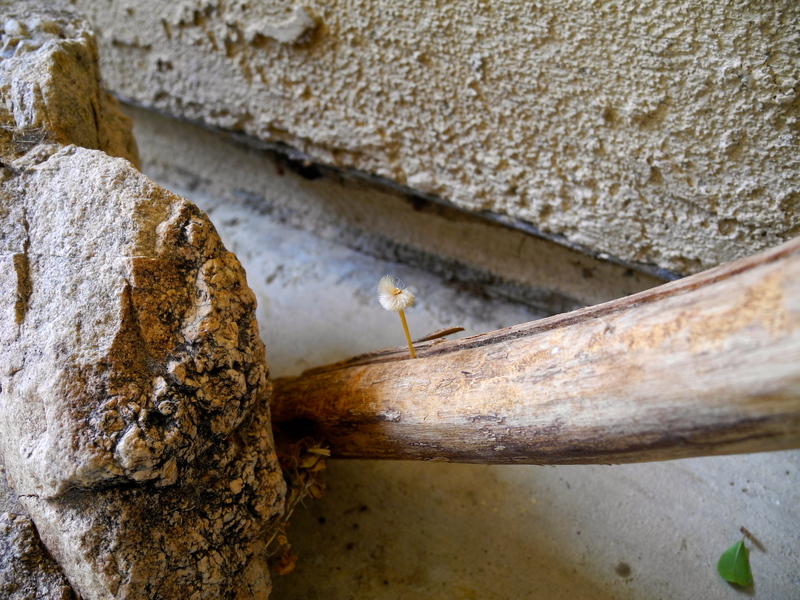 This morning the walking stick proudly displayed a new growth which has sprouted from a deep crack that threatens to split it in half. What new adventure awaits my trusty walking stick? It seems that a new chapter is beginning, and I know not what will appear next. This is for the walking stick to know and for me perchance to discover. For I am an observer who can only guess at the meanings, relevance and connections between the two. If I should hazard a guess, I would say that the new growth is a fungi of some kind that nestled within the confines of the crack in the walking stick, having been blown here by the wind, or perhaps it originated in the desert and then lay dormant for years until the damp porch helped create the perfect conditions for its appearance. I must say that I was seriously astonished to see the new growth on my walking stick. Living in this modern world, I was of course, rushing to get out the door, arms fully laden with the day’s necessities, when this diminutive stalk and powder puff demanded my attention. I dropped my bundles, dug out my camera, and captured the moment. And then I stopped my rushing and took a deep breath in celebration of nature’s surprises. How wondrous is the mystery of my day that the power of beauty can stop a trip out the door and result in such a discovery that demands that the timetables of my errands be suddenly and definitively delayed. How wondrous is our world in which such a day can fall into your lap! How rich is our journey which can reveal new mysteries when we least expect them! I wish for you a weederful, wondrous day!